We’ve always thought of ourselves as a green agency. We like the environment, and we try to do things in a sustainable way. But, beyond making sure our RedBull cans end up in the recycling and trying to convince our clients to use sustainable printing practices – there’s not too much of an environmental impact we can have in our normal in-house operations. If we – as an agency – are going to have a significant environmental impact, it’s going to be through our clients. Lucky for us, we’ve been able to carve a niche for ourselves in advertising for the energy efficiency industry. Precision-Paragon [P2] was one of our first clients. Headquartered in Yorba Linda, [P2] makes energy efficient lighting for commercial and industrial buildings. They estimate that their products have saved more than 12-Billion Kilowatt Hours of electricity. And, using the energy-savings calculator we built in to their website, you can see that savings translates in to the CO2 emissions reduction equivalent of preserving more than 64,000 acres of forest. Through our early work with [P2] we were introduced to American Lighting, a San Diego company that performs energy-efficient lighting retrofits. In 2009 they were awarded for creating more than 27.7 Million Kilowatt Hours of electricity savings in the San Diego area alone. 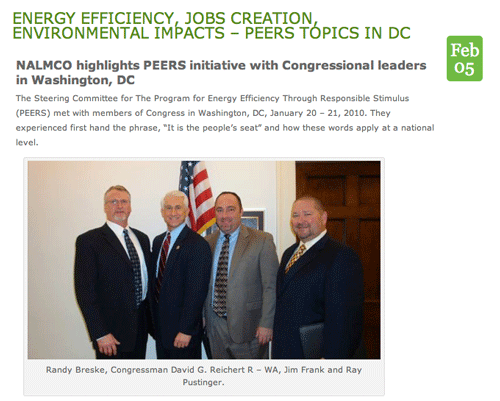 In mid-2009 we worked with NALMCO and [P2] to create the website and branding materials for the PEERS Alliance – a nonprofit industry association that is going after federal funding for energy-saving commercial and industrial retrofits. The proposed program has the potential to hugely reduce our country’s energy consumption. In January we did a bit of lobbying work and set up meetings between PEERS Alliance board-members and some receptive congressmen in DC. A few months ago we began to work with Every Watt Matters, a company that provides home energy audits and energy efficient retrofits. Since their launch in March Every Watt Matters has already moved into three California markets (Yucaipa, Claremont and Sonoma) , and they’re poised to go national. According to a recent study, retrofitting a single 1960’s era California home with the type of energy saving upgrades that Every Watt Matters performs could save 8.5 Tons of CO2 emissions. Applying that figure nationally gives some staggering results. Greenwashing is an all too popular trend. But our energy efficiency clients are doing real, significant things that directly reduce energy consumption. No advertising agency wants to be typecast in one industry, and we do have a wide-range of clients in other industries. But, if Echo-Factory is going to gain a reputation for working in a niche – one that has such a positive impact on the planet isn’t such a bad role to be cast in.